Welcome to the Arundel Riding Centre. We are a long established family run riding school and can offer a range of lessons for everyone. Please take a look at our lessons and activities page as there is something for everyone. We also hold various shows and clinics, keep an eye out on the news and events pages for more details and after show photos. 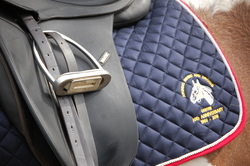 Dressage results are now up - have a look on the Events page to check the results. Well done to all of those that took part! Don't forget - only a week to go now until our Christmas Fun Show - for details click on the link and have a look! Change of dates for class lessons over the Christmas period - see the Lessons page!! As the season changes and the days get shorter time to think about making arrangements for riding. 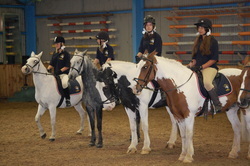 Arundel Riding Centre has both an indoor school and an all weather school with lighting - so we ride whens others can't. Saturday 11am - New novice childrens group. Suitable for children who can steer, walk, rise to the trot and who are starting to learn to canter. This group is aimed at improving a childs confidence within a group scenario and they will then be able to progress to a more advanced group. Starting on Saturday 7th December. For details on other class vacancies please see our Lessons and Activities page. Sometimes the ponies do something just a bit different ! Ivan, one of the riding school ponies, was taken to Ascot to participate in a special race. Ivan, ridden by Ivan Leggett , had a great day at the race course. Arundel Riding Centre is able to offer riding lessons all year round. Have a look at our Lessons and Activities page for full details. Our selection of horses and ponies ensures that there is a suitable horse or pony for you to ride - whether you are new to riding or have more experience. There are individual and group lessons for both children and adults. So why not come along and get to know us. Why not make your break complete with an escorted ride or lesson at Arundel Riding Centre.